Thanks to our generous benefactors, this service is offered free of charge for blind students in grades 1-12. To order an article, complete and submit the following form or contact Seedlings toll-free at 800-777-8552. 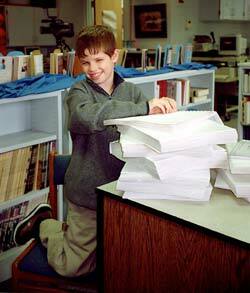 "Thank you so much for providing my students with encyclopedia articles in braille. My 7th grade student is an excellent reader who has a strong desire to learn as much as possible. She loves reading the articles. She reads and re-reads them." NOTE: Articles will be shipped Free Matter f/t Blind. please be sure to include your school name. NOTE: Please be as specific as possible. There are two versions of World Book available: World Book Kids (shorter, easier articles for young students) and World Book Student (longer, more in depth articles for mid to upper elementary and beyond). Would you prefer: World Book Kids or World Book Student? Yes, please send me emails with updates, news and special offers. Answering the following question will enable your form to be sent to Seedlings: 7 - 3 ? and will be shipped Free Matter for the Blind within 5 working days. Please allow 1 to 3 weeks for shipping!